I have had this for 3 years and still love it. The rake did rust and brake after 2 years but it did not cost much to replace. 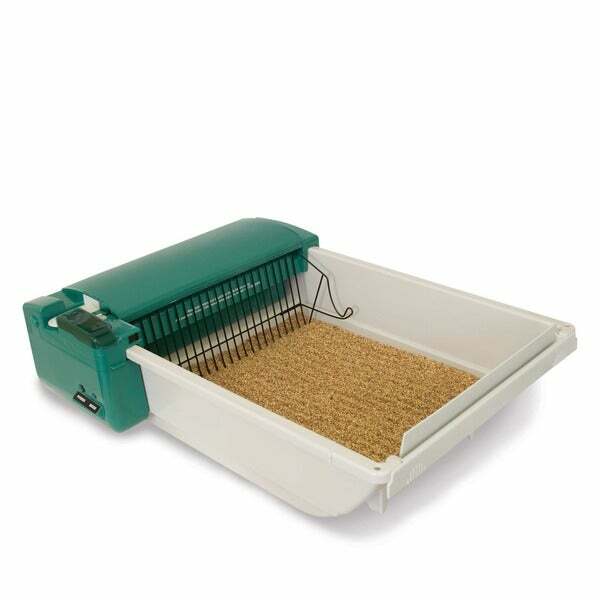 Get more out of your litter box with this SmartScoop intelligent box by Pet Zone. A health-monitoring system is built-in and sends messages via Bluetooth, showing you your cat's elimination habits and alerting you to needed maintenance, such as changing the bags. This self-cleaning box works with any nonclumping cat litter, helping make your life a little less stressful. EXCELLENT EXPERIENCE! I bought two of them (three cats, our siamese simply will not share her litter box). I have had the PetZone boxes for over a year without a problem. This cat box saved us a lot of trouble. Siamese, appropriately named Monster, won't use a dirty cat box. I sobbed at the thought of getting rid of her, but I cannot have a cat who urinates on clothes. This box rescued all of us. Monster's cat box is always clean. I didn't realize what a big deal it would be for a cat to use a dirty box. This was amazing! As soon as the cat used the litter box it was scooped clean. Very easy to change bags. This litter box is great! I have multiple cats so I use it for one in a separate room. The poop holder is a tad small do you have to empty the rest every other day or do but worth it due to not having to scoop the litter box! I have read alot of reviews on this product in other places and there's about of people who say it didn't last long. I feel like I took a gamble on buying this. So far so good though. Assembly was a little confusing. Im still not sure if I "engaged the clutch" ect. I wish the rake scooped all the way down to the bottom but I understand why it didn't. That would wear the motor down fast. I will probably have to 'stir' the litter pan periodically or it will miss some could. I'm ok with that over have to scoop everyday after a long day at work. I have a very big cat and let's just say he's high maintenance. EDIT- - Purchased this 7 months ago and I'm very please with it! EDIT-- One year since purchasing and it runs just like new. Still happy with my purchase! Great purchase so far . Rake picks up most of the waste and drops into a chamber so there is very little smell. I would recommend this to other pet owners. Does well for about 6 months, and then stops working. Tends to hang up. This is my 2nd box, and hopefully will last longer. This product was not what was pictured, we ended up returning it and going with something different all together, I was really hoping it was what was described, it would have been good to have! "Is this box suitable for multiple cats"
This box will work for up to 2 cats.